This section provides a tutorial example on how to submit a test request to the REST Web service server represented by the port location. To call the REST Web service defined in the REST project created in the previous tutorial, I used the submit function on the request template. 2. 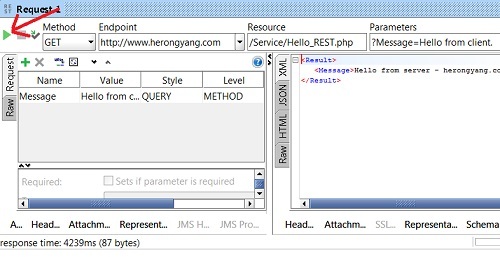 Look at the icon area below the title bar of the request template, the Web service endpoint location, http://www.herongyang.com is displayed. 3. Click the triangle icon, the one that says "Submit request to specified endpoint URL". In a second or two, the XML response received from my Hello Web service server will be displayed. The picture below shows you the request template with the response message. The "Submit" icon is highlighted too. Congratulations! We have successfully created a REST project and made a request call to the REST web service.